1.Make the Marinade / Sauce by mixing all the ingredients together, but the mushrooms. Set aside. 2. Clean the mushrooms by first cutting away the thin membrane on the edge of each mushroom, next, remove the veins with the edge of a tablespoon. finally, slice them into 3/8' slices. Place them in the marinade. 3. 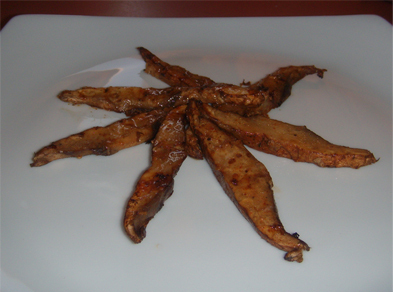 Grill the sliced mushrooms over a hot grill for about 10 minutes, turning once, and basting often with the marinade. Fry in a Teflon fry pan over high heat with some butter, and a little of the marinade., until they just begin to get soft. Serve with additional marinade drizzled on top.